Bring the whole family on your next charter – that includes the dog! Are you planning your next holiday and asking yourself, “What should I do with my dog when I go away?” We say why not bring your dog with you? 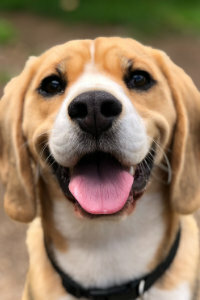 At Hamble Point Yacht Charters, we understand that your dog is part of your family and you shouldn't have to leave them behind. That's why we welcome your pet on-board our yachts, at a small additional cost. Exploring new places and having adventures is what dog owners and dogs love, so you should all be able to do it together. 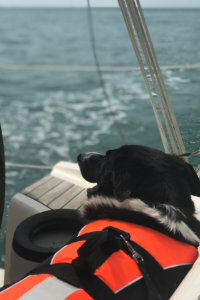 Here are a few tips and things to think about to prepare yourself and your dog for your next sailing adventure! Life jackets are essential when sailing with your dog. Your dog may be a strong swimmer, but they'll eventually get tired. If your dog were to fall overboard or got too excited and decided to jump in, it could take time to manoeuvre the yacht back. Life jackets also make it easier to lift your dog on to the boat or out of the water if they have a lifting strap/handle on the life jacket. You can purchase Life Jackets for dogs in advance. This helpful guide gives some more information on sizing, style and where to buy these Life jackets. When moving around marinas and on pontoons, keep your dog on a lead to keep them safe and to prevent any unwanted jumps into the water! Moving around and getting comfy on-board can also be quite tricky for dogs. Try using a bathroom mat with non-slip coating on the back to allow your dog to sit and move around more comfortably. It comes as a surprise sometimes, but England can get very hot and very sunny in the Summer! To protect your dog from the sun, use some doggy sunscreen. Make sure there are enough cool, shaded areas on board and that you have plenty of water. Try using a dog bowl with a rubber bottom to stop it sliding around. If you plan on sailing with your dog a lot, we recommend investing in a Buddy Bowl! Dogs can get seasick just like humans. Consult your vet before your charter on anti-sickness remedies for your dog. You may find that if you're sailing around the Solent that you're stopping quite regularly to see the sights of the South Coast. 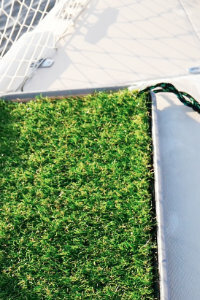 If not, we recommend bringing a patch of artificial grass and tray that will encourage your dog to use that. These are easy to clean and avoid having mess roll around on the deck! If you're travelling to France, ensure you have all the necessary paperwork and vaccinations required. The RYA have some more information on travelling with pets here. If you're taking your pet sailing for the first time, be prepared to give lots of love and comfort as there is a chance they might be scared. We suggest finding a safe corner in the saloon that they can curl up in and feel safe. So the next time you're planning your UK charter, don't worry about leaving that vital member of the family behind. Be organised and use these tips and it can be plain sailing!